The last decades show a clear trend in business: away from big, comprehensive trusts which can cover all stages of a value creation chain, and away from long-standing, well-established and stable supply chains. Instead, companies are increasingly focusing on their core business competencies and often enter into flexible alliances for value creation and production. This growing demand for flexibly interactive and efficiently integrated businesses and services has already led to a significant amount of scientific and technological research on enterprise interoperability. This has already achieved promising results, and has been partly responsible for initial commercial products and service offerings and operational, deployed applications. Nevertheless, these remain at the level of data interoperability and information exchange; they hardly reach the level of knowledge integration, and certainly fall short of knowledge-based collaboration. We claim that research on collaboration patterns in the event-driven future Internet has the potential to facilitate the satisfaction of these needs and provide the underlying technological infrastructure for supporting adaptive enterprise collaboration through knowledge services. We work on the development of such knowledge services within the SYNERGY project, which aims to enhance support for the successful and timely creation of, and participation in, collaborative virtual organizations by providing an infrastructure and services to discover, capture, deliver and apply knowledge relevant to collaboration creation and operation. 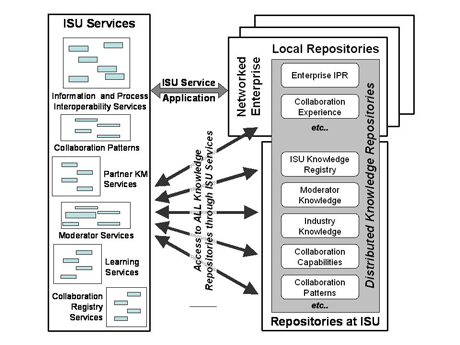 Figure 1: SYNERGY develops Interoperability Service Utility (ISU) services to help networked enterprises discover, capture, deliver and apply knowledge relevant to collaboration creation and operation. The vision of the SYNERGY project is related to a Web-based service-oriented software infrastructure that will help all kinds of companies that need to engage in collaborative ventures to discover, capture, deliver and apply knowledge relevant to collaboration creation and operation. This will allow them to effectively and efficiently participate in Virtual Organizations (VOs). The SYNERGY architecture takes up and refines the challenge of the Interoperability Service Utility (ISU) as defined by the Enterprise Interoperability Research Roadmap produced by the European Commission. This challenge is to produce an open, service-oriented platform that allows companies to use an independently offered, intelligent infrastructure support to help in the planning, setting-up and running of complex knowledge-based collaboration. The business models supported by SYNERGY refer to virtual value networks of enterprises. Through its lifetime, each network will develop project-specific knowledge. This is in part knowledge specific to the networks product or service, and to the processes and technology involved, but it is also related to the current state of the network in its life cycle. In most cases, such knowledge needs to be maintained only for the network and its partners because it is of no use, and is possibly even very confusing, outside that context. Nevertheless, there may be a need to analyse such knowledge and its evolution to provide improved patterns for the future, thus forming a basis for organizational learning. Such collaboration patterns may then enter the public domain to support future collaborations across, say, an industrial sector. However, there will be cases where it is precisely this knowledge which represents a competitive advantage to the network or partners concerned. These cases need to be identified and services must deliver new learning to a specified and appropriate audience of future users  perhaps only partners in the network generating this new knowledge. The maintenance of a library of appropriate collaboration patterns, available as process and service templates to be specialized as necessary and applied to network enterprises either as they form or as they subsequently evolve, is central to the support of knowledge-based partner collaboration in a VO. The SYNERGY system will therefore embody structures and services to define collaboration pattern templates and to select (according to the nature of a developing or existing/changing network), specialize and apply such templates. In SYNERGY we have adopted and extended work on software patterns in the knowledge-based collaboration realm. By adopting patterns as the organizational model of collaboration, users will work in a more complete context for their actions and be burdened by fewer manual integration tasks. At the same time, by dividing collaborative work into distinct activities, users can focus more readily on a particular activity and deal more easily with interruptions by suspending and resuming activities as needed. Collaboration patterns augment rather than replace collaboration services and tools. Through reference-based integration methods, collaboration patterns introduce new views and organizational schemes that cut across service and tool boundaries, thereby increasing the integrity of the representation of work and mitigating scatter. In SYNERGY we assess the appropriate level of pattern granularity (abstraction) and represent collaboration patterns using ontologies (an ontology for collaboration patterns, codenamed COMPANION, is publicly available). This ontology will be used to represent collaboration patterns as a collection of relationships that emerge between people, the resources they use, and the artefacts they work on, as well as for the communication, coordination and business processes used to complete their work. We envisage three ways for generating collaboration patterns: manually, from best practice data; semi-automatically, by detecting prominent usage patterns using folksonomy techniques; and by community members themselves, either from scratch or as refinements of existing patterns. SYNERGY is expected to benefit virtually collaborating organizations in many ways. As a learning organization a collaborating partner is better able to exploit past experience in responding to future opportunities and in particular to opportunities for participation in collaborative networks. Enhanced sharing of knowledge accelerates and improves network decision making, shortens time to market and reduces network operating costs, whilst improved capture and especially reuse of enterprise and network knowledge though collaboration patterns reduces the cost of repeating work of earlier projects, and of repeating past errors.